Create 10 Pictures One Sticker at a Time! 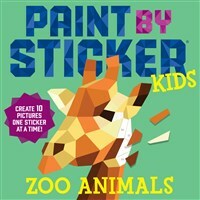 Young readers can create 10 bright and playful low-poly artworks featuring favorite zoo animals, one sticker at a time. The boredom-busting fun of coloring meets the joy of paint by number and the fun of a sticker book.